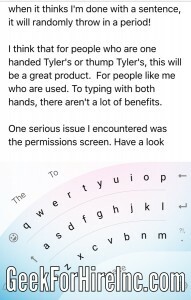 Last week Chris introduced me to a new keyboard app for the iOS. He thought it might help me have less.carpel tunnel symptoms while typing. I’m trying it out by typing this blog with it. 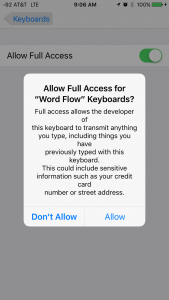 It is called Word Flow and was developed by Microsoft. One issue that I am experiencing is that when it thinks I’m done with a sentence, it will randomly throw in a period! Another issue is that it doesn’t “know” the shortcuts I’ve programmed into the phone to get a jumpstart on the predictive text. For example, when I type “bou”, the iPhone will complete the word “Boulder. Word Flow doesn’t do that. 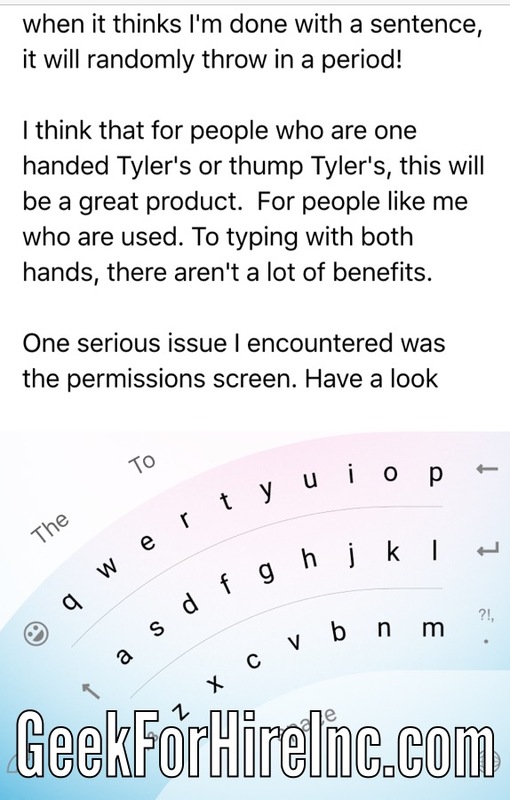 I think that for people who are one handed typers or thumb typers , this will be a great product. For people like me who are used to typing with both hands and more than two thumbs, there aren’t a lot of benefits. 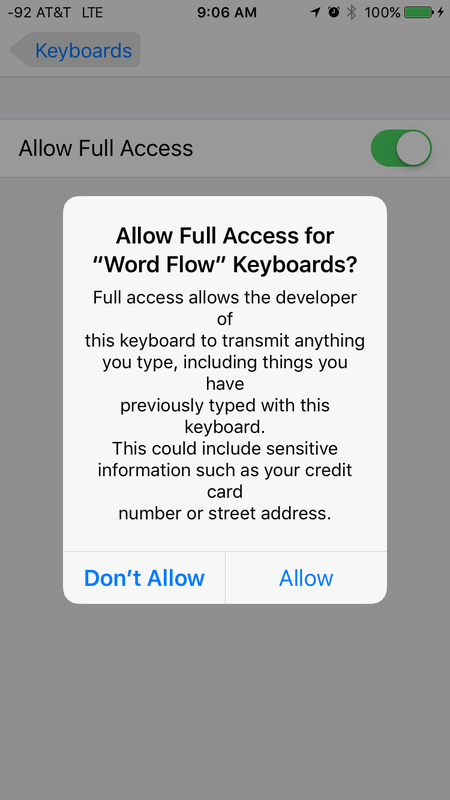 As a person who is very much concerned with security and privacy, I did take exception to allowing Word Flow access to my data. Take a look at the verbiage for the “permissions screen”. Ummmm, no. I think that is part of why the shortcuts I’ve programmed into my iPhone aren’t working with this app. If you think this might be right for you, take a look at this, more positive review. What keyboard are you using with your smartphone? Is it the standard one that came with, or another app that you’ve installed? Let us know what you are using, which phone you have, and how the keyboard is working! From what I’ve been reading the new Oculus Rift is essentially just for playing games. When you head to their website, you can watch a video of the user interacting with some of their games. Although new games are being added all the time, it makes me wonder if there really is an future in VR beyond games. If you’re like me, sometimes a little clumsy with your cellphone, you need to have a protective cover to keep the screen from cracking – or worse! If you’re also like me, on your phone all day, sometimes watching Youtubes, and generally using up all the electric juice, you’ll also need to have an extra battery to keep your phone charged up. Lucky for us, you can get both protection and extra juice in the same case. Because I’ve only used iPhones, I’ve only reviewed iPhone cases, but I will provide a few links to cases for other brands as well. I’ve used a Mophie for my last two phones and have been very happy with them. At family events when I want to take lots and lots of video’s, I can use it all day long and not worry. Most days, running Geek For Hire from where ever I happen to be that day, I use all of the iPhone’s stored power and a little of the Mophie’s power as well. It’s sleek, and I like the colors they have available. My current one is blue. The one for my last iPhone was red. I probably drop my phone once a week or so and, sure, the Mophie has a bunch of scratches, but the phone itself is just fine. The Lifeproof case is exactly that. Lifeproof. It protects against submersion in water or mud. It protects against dropping from heights. It fully encloses the iPhone in a bubble of protection. Plus, the Fire Power model gives you extra juice for long days. The Lifeproof is the one both of our kids are using on the Appalachian Trail. And that makes sense for people who are fording streams and hiking through rain. It also helps their phones last through several days between recharging. It even has little O-rings so when you plugin your headphones the entire unit remains water-tight. So, yes, if that’s how you plan to use your iPhone, get a Lifeproof. Before I got my current blue Mophie, Chris talked me into getting the Lifeproof Fire Power. It was big and boxy. It didn’t always sense when the iPhone was running low on juice. So it didn’t switch over to it’s battery and my phone ran out of power and turned off. That was pretty inconvenient! It lasted about a week with me before I traded it in for another Mophie! Have you used a protective battery case for your cell phone? What brand of cellphone do you have? Which case do you use? How was your experience? Let us know in the comments below!